Comments: These medium-sized, secretive forest birds are easy to identify if you are fortunate enough to see one. The rusty red-colored shoulders, chestnut-colored body and the boldly barred black and white tail and flight feathers give it an elegant appearance. They prefer large tracks of mature forest, near water. 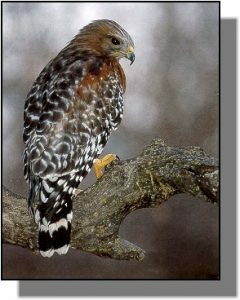 Distribution: Red-shouldered hawks are found in eastern North America from southern Canada to northern Mexico and in the western United States from southern parts of Oregon to Baja California. Birds in the northern parts of their range are migratory; birds in the southern parts of their range probably remain as pairs in their territory throughout the year. In Kansas, they are found in the wooded eastern part of the state from April through October. Populations are dropping throughout their range due to habitat loss. Food: Their diet consists of small mammals, reptiles, amphibians, small birds, insects and even crayfish. They hunt from a perch or while flying.